← How Far Can Kentucky Football Fall? Is it time for Mitch Barnhart to go as well? First the “microwave” comment and now the “real fans/personal agenda” comment. Mitch is becoming a hard man to support. Mitch, here’s a novel idea. Kentucky Football fans may not be satisfied with losing and being the carpet over which the rest of the SEC (now including Vanderbilt) stomps. Joker Phillips is not earning his keep. He is now 1-9 on the year. He’s lost the fan base because he is losing games. No one gives a damn about his color. If he were winning, everyone would be behind him. He’s not winning. He’s being paid to win ball games. He’s a terrible coach who hasn’t had a prepared team in his three years as coach. He should be employed based upon his talent, skills and record as an SEC Coach. His employment should not be guaranteed based upon cronyism (i.e., his friendship with the AD). This isn’t the first bout of poor judgment on the part of Barnhart. He kept Tubby far too long after letting Tubby pimp a larger and wholly undeserved pay raise. He let Tubby squeeze a loyalty bonus out of UK even as Tubby planned his move to Minnesota. 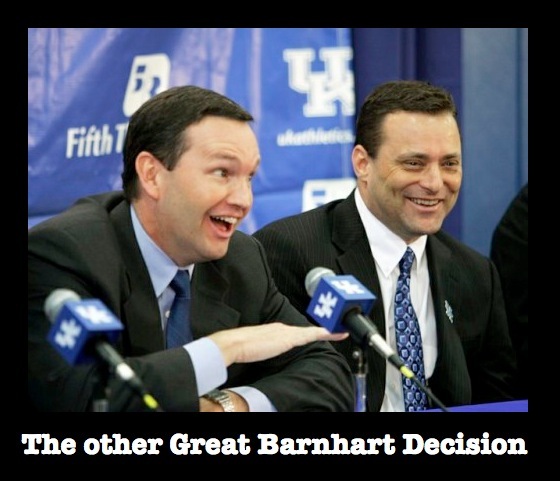 Barnhart hired Gillispie and nearly killed Kentucky Basketball. He missed the opportunity to hire Mike Leach. He was against hiring Calipari and has caused turmoil with his attempts to exert control over the basketball program risking a rift that might have caused Calipari to depart the program. It’s past time to let Joker go. Do your damn job, Mitch Barnhart. I think both should be given life time contracts.